Two students in Professor of Practice Lou Lenzi’s INFO H567 class at the Indiana University School of Informatics and Computing at IUPUI were part of a three-person team that recently won the True AR Challenge. 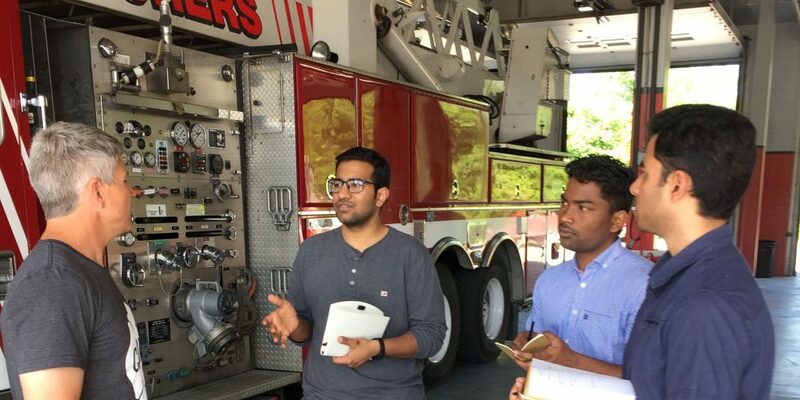 Members of Team HCI, Sandeep Jagtap and Rahul Jain, along with Pruthviraj Narayanaswamy, took first place for their AR (augmented reality)-based solution fitted to fire trucks. True AR Challenge is an AR app design challenge for developers and designers, sponsored by WayRay, a pioneer of holographic AR displays. In February, WayRay challenged AR enthusiasts to come up with a concept for a new AR app for cars over a three-month period. Team HCI developed a holographic windshield navigation app, called Fire Ray, to help fire emergency vehicle drivers respond to accidents quickly, efficiently, and safely. Rahul Jain explained that all emergency vehicles need to have best in class technology to save citizens from an emergency situation. “H567 taught us frameworks to solve business and design problems in a very user-centered way. Applying those methods helped us in telling a better story with data,” Jain said. Way Ray will fly Team HCI this fall to California to work on a prototype. Lenzi’s class, Topics in Human-Centered Computing (Lenzi’s students study Internet of Things (IoT) Interface Design for Business Innovation), is offered twice a year—fall and spring semester—and focuses on solutions to real-world problems through industry-sponsored projects. The Internet of Things is a network of connected physical objects or “smart devices” that collect and exchange data. Students develop and refine IoT interfaces and their business models, while acquiring skills through their team-based projects. Each semester, industry sponsors meet with the class to kick off the project and then return to evaluate the results. Last school year, sponsors Amazon.com, General Electric, Crown Equipment, IBM, Beck’s Hybrids, and the City of Rushville led study modules focusing on specific industry verticals. The representatives then issued a design challenge to the students that addressed a potential future disruption to their respective industries. The industry representatives are also invited to deliver a talk at the School of Informatics and Computing as part of its Industry Lecture Series, which is free and open to the public. The fall 2018 schedule will include presentations by Sirius XM Radio, Shure Corp., and Delta Faucet. As a result of her experience with a H567 course project on smart cities, involving the city of Rushville, IN, one student is now interning with the city of Boston. Rachana Solanki is spending the summer working in the mayor’s Office of Neighborhood Services. She is working on their Language and Communication Access (LCA) program, as a user experience designer, helping to make Boston more accessible for all residents. Solanki credits the job offer to her experience working on the “Smart City of Rushville” project in H567. “The hiring manager in Boston was really interested in the project, the process, and the results, as much of the interview was spent on this topic,” Solanki said. Earlier in the year, students from Lenzi’s class distinguished themselves at the AT&T IoT Civic Hackathon, held this year at the newly opened Indiana IoT Lab in Fishers, IN. The Hackathon hosted over 200 developers from 30 teams. The theme this year was public safety and solutions to help first responders. The First Volunteer team—Anagha Varrier, Jagtap, and Jain—earned first place for Best FirstNet App, as well as a second place finish for Best Mobile App. FirstNet is the First Responder Network Authority whose mission is to develop, build and operate the nationwide broadband network that equips first responders to save and protect lives in the U.S.
Often in the case of a massive natural disaster, civilians are the first on the scene to provide help. First Volunteer offers quick assistance to first responders, like fire and police department personnel, through registered civilian volunteers. Lenzi originally conceived his IoT course because he believes students that possess HCI-based skills coupled with basic business design principles can drive innovation across any number of industry verticals and governmental operations. Lenzi noted the results from the first two semesters are very encouraging. “I’m truly impressed with how our students are so committed to their education, taking the initiative to go outside the classroom and work on projects to improve our communities,” Lenzi said. Lou Lenzi retired as a senior executive with experience at IBM, Thomson/RCA, and GE, and joined the IU School of Informatics and Computing as a human-computer interaction instructor. In 2016, Lenzi was named one of the top 50 Industrial Designers over the last 50 years by the Industrial Designers Society of America, and in 2018, he represented Indiana University at the opening of the Indiana IoT Lab in Fishers.